When you can’t use our books in person, you can sometimes connect online. Every Buffalo researcher should get to know these online book sites. We LIVE at Google Books. For historical researchers, Google Books is the most important part of the Google empire. For several years, Google has partnered with several major libraries, including Harvard, Cornell, and the New York Public Library, to digitize millions of books and periodicals. The results are full-text searchable for names of individuals, places, specific phrases, businesses, organizations, events, anything you’d look for the regular Google home page. 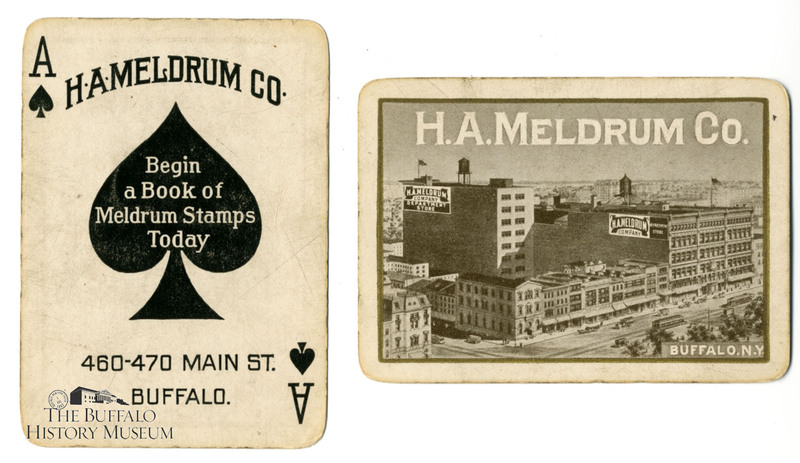 Fortunately for us, many of the participating libraries happened to collect books on Buffalo. 4. No preview: the book is not online, usually because the sole surviving copies are owned by one of the many libraries (like us) who are not part of the Google Books project. Other useful features: you can bookmark your finds in a feature called My Library and share your lists. You can download entire free books in PDF and read them offline. Because Google is a business, you can also purchase newly released e-books for your e-reader. Archive.org is the not-for-profit alternative to Google Books. It presently has 8.8 million volumes online and all are free and full text. Their library partners include the Library of Congress, the University of Toronto, and Columbia University. To search it, click on the magnifying glass icon in the black navigation band across the top of your screen. Archive.org lags behind Google Books in its full text searchability for a specific name, phrase, or term. However, anyone can upload a text to Archive.org. Download options include formats designed for screen-readers used by people with vision loss. HathiTrust is a consortium of a hundred academic and research libraries around the world who are digitizing books. It presently has 13.8 million volumes online. About 40% are available for free in full text. To download a book that is still protected by copyright, you have to be affiliated with a member institution. At present, the closest participating institution is the University of Rochester. Like Google Books, HathiTtrust offers you the option of searching the full-text of everything for a name or phrase. You can create collections (bookmark your finds) and share them. You can also limit your search to books that are online in full text. The Gutenberg Project is the grand-daddy of all online book sites, founded in 1971 before any of us had ever heard the words Internet, Browser, or Digitize. It presently offers over 50,000 books, all of which are online for free in full text with several downloading options. Gutenberg is full-text searchable, as well as browsable by author, title, and subject. Unfortunately, the Buffalo content here is minimal. Naturally, we cannot omit our largest in-house digital project, our online catalog. It lists over 27,000 distinct books, manuscripts & microfilms in the Research Library collection. We are continually cataloging new and old stuff. When we learn about free online versions of works that we own in hard copy, we build links into the bibliographic record. Try searching for a person, place, thing, business, church, organization, event, and maybe one of your results will lead you to a full-text, online version. Here I am surrounded by my current project – working my way through the collection of die-cast model cars, busses, trucks and airplanes. A little more than a month ago, I accepted my current role as the Greg D. Tranter Collection Manager at The Buffalo History Museum. You may say that I am in training to become the ‘resident Buffalo Bills expert.’ I am responsible for the cataloguing – what we call ‘accessioning’ – of the Buffalo Bills collection donated by Greg D. Tranter that was announced to the public at the end of April 2016. Greg is pictured at the desk where he does most of his preliminary work before sending the objects to us at the museum. It isn’t just any “Buffalo Bills collection” though – in its entirety, it includes 100,000 artifacts and archival objects and it has been reported on heavily here in Buffalo and even as far as Boston. The Sports Collectors Daily described the collection as “jaw-dropping” – I would agree, wholeheartedly. For a Bills fan, it is jaw-dropping for the singular reason that it is an enormous collection celebrating our football team. It celebrates the good, the bad and the ugly, depending on how you wish to interpret certain events: wide-right, anyone? For me, it is jaw-dropping because of the complete and exhaustive collecting undertaken by Greg: for example, the collection includes every single program ever produced since the very first game in 1960; he isn’t missing a single one! If a series of Christmas Ornaments was produced, Greg collected every one of them so that there would be a complete grouping. So, what’s happening with it? The accessioning process for the tens of thousands of artifacts is going to take years and the steps we take to register an object can be time consuming, especially if it a multi-piece object (like a Tailgating themed pick-up truck with tailgating accessories – a grill, a couple of coolers, etc). Every single object goes through our cataloguing process which includes a number of steps. Once the white cotton gloves have been put on, an object is carefully handled and described: we take note of any labeling on the object or packaging, the condition it is in (we look for any scratches but also remark if it’s in excellent condition), and then we measure (for storage and display) and take photographs. Every object is assigned a unique identifying number, what we call an Object ID; once the number has been assigned, we input all of the data into our cataloguing system, Past Perfect. The end result is a Subject Card that gets added to our vertical files that are housed in filing cabinets (like the one in the photo to the right). This allows us to have two points of reference; the new system of Past Perfect and the old catalogue-card system. The final step in the process is to find a “home” for the object in our storage. We store everything in acid free boxes that are organized by classification. This is done for the long-term preservation of an object but also to ensure easier discovery for future Collections staff. Okay, so there is still a lot of work to be done. Can we still see the Collection even though it isn’t on display? Absolutely! We have lots of projects on the go to ensure that we are sharing the collection with you. Over the next year, we’ll be putting together a virtual exhibit that will be accessible on our website (www.buffalohistory.org); it will include a variety of objects and related information, in addition to some oral histories shared by the donor, Greg. Like the accessioning process, that will take time. In the meantime, I plan to do a few more blog posts since I could talk forever about the parts of the collection that fascinate me (like the Art Baker jersey or the O.J. Simpson “See-Action” football board game and the “Bermuda Triangle” poster with Fred Smerlas, Jim Haslett and Shane Nelson)! More immediate though, is our sharing on social media; if you don’t follow us on Instagram, Twitter or Facebook and you would like to see more of the Greg D. Tranter Buffalo Bills Collection, you should! We would love to hear your thoughts, memories and stories about an object we share – maybe you even have the same thing at home. Of the few hundred objects I have accessioned thus far, this stein is my favorite object. It has a raised scene of a football game, complete with a quarterback and referees and an oversized logo at the front. Megan MacNeill, Program & Engagement Coordinator with actor Josh Gad, who came to visit the museum while in Buffalo filming. Hello! My name is Megan, you may have seen me here at The Buffalo History Museum, running programs, crafts, and activities! As Program and Engagement Coordinator, I am tasked with creating and running lectures, our ever-popular Train Day, and many other events throughout the year. While I am not a native Buffalonian, I have come to love my new city, and all the history and experiences that it has offered me. I have been in my position here for a year and a half, and it has flown by! Previously, I lived, studied, and worked in Philadelphia, PA. I went to graduate school and received my MFA in Museum Exhibition Planning and Design. Before I came to Buffalo, I had worked in nine different museums and many different disciplines; from horse racing and dance, to outsider art and the history of chemistry. Regardless of the museum, the amazing stories are what keeps me passionate about my work (and an ever-hopeful Jeopardy! candidate). For instance, the first synthetic dye was developed on accident by a man named William Henry Perkin. When he created that bright mauve color, he was hoping for a synthetic quinine to help treat malaria. My favorite stories here are the not-so-apparent ones. The hidden fossils in the floor of the State Court, the tiny “make-due” piece of a blue star in a quilt, and the symbolism in our WWI propaganda posters. My love for museums, like many of my peers and colleagues, came from an early age. When I was little my family would take yearly trips to Washington, D.C. My sister and I would drag my parents to the same exhibit, the gemstone room at the National Museum of Natural History. We were fascinated by the colors and sizes, and of course, the Hope Diamond. I am incredibly fortunate; every vacation we took as a family featured at least one day-trip to a museum or historic site. Though my parent’s ploy to make us learn may have worked too well, my dad almost kicked my sister and I out of the van on a trip home from Cape Cod because we so desperately and relentlessly were asking to visit the Sandwich Glass Museum again. Luckily we stopped for a visit. What sticks with me just as much as the stories and facts that I’ve learned, is the time spent with loved ones. I feel that museums have a dynamic way of opening us up to learning and also to being in the moment and connecting with each other. This is why I love what I do. Providing our guests with the opportunity to engage not only with our objects and exhibits, but with each other. So please come vi sit us! Every Third Friday I run hands-on activities in our State Court. They are free and accessible to all ages. In June, we made solar prints. Harkening back to my days as a photography major, we placed found objects on light-sensitive paper, and created our own cyanotypes. This summer I will be representing the museum down at Canalside as well! Come see some great old views of the historic canal district (sourced from our library of course) and learn about the history of the Erie Canal! Mondays 12-4, Wednesdays 11-3. It is amazing the difference only a year can make. The summer of 2015 was carefree, full of late nights with friends and packed with preparation for all the events held at The Buffalo History Museum. It was one of my favorite summers to date; I tried to soak it all in and garner as many memories as possible. I knew – I just knew that no other summer would be the same, you see I was pregnant with my first daughter. Darcy Rose entered the world after a smooth pregnancy in late November of 2015. And I was right, this summer is not the same, she has been life changing – in the best way possible. While last summer was fun; having that pregnancy glow, everyone congratulating you, even receiving all that advice, all while working as hard as possible to present The Museum in the best way – this summer is better. I may have been the one pregnant but when Darcy was born she entered more than just her small family of myself and her father, the whole Museum adopted her. She will grow up here at the Museum, at our Food Truck Rodeos and Toddler Story Time. I am excited to introduce Darcy to all the people and things I love about The Buffalo History Museum. Being a working mom is hard and not only for the mom. Schedules can change suddenly, what worked before may not work now. Through all the trials and tribulations my fellow staff members have been amazing. As a new mother The Buffalo History Museum has come to mean more than a place to enjoy and work. It has become a legacy of fun and education for my friends and family. Part of my job as the Graphic Designer here at The Buffalo History Museum is to layout our quarterly newsletter, The Album. Each newsletter has a different theme that then translates down to the content and cover image, for example last month’s theme was “Connections.” Our summer theme is “Celebrations,” where we will be featuring upcoming museum events, exhibits, and artifacts fit for a celebration! Catalogue boxes and file folders filled with images from TBHM collection. I went right to our Research Library in search of the perfect cover image, which was harder than one would think. Celebrations should be easy to find, right? People having fun at a party, smiling candidly, clinking champagne flutes…or not. With the help of our Librarian, Cynthia Van Ness we had to think of some “outside the box” categories to broaden our image search. First up were program books from local parties of the past, while there were some interesting finds, like this adorable football invite for a Canisius high school banquet from 1936, most did not have much imagery to them. Next we tried to focus in on celebrations that happened at The Buffalo History Museum, past exhibit openings, Annual Meetings, milestone anniversaries etc., but sadly cover worthy images still eluded us. Then, jackpot! After changing our party-centric mindset we moved toward parades and picnics and there came the celebratory moments we’ve been searching for! Let me tell you there were a wide variety of parades held in Buffalo; Loyalty day, Ringling Brothers and Barnum Baily Circus Parade, Allentown Village Society Parade, and even a Storybook Land Parade. The picnic photos were eye-catching as well as capturing summer holidays grilling with family or laughing in the park. Now for which image won the cover you will have to wait in see. The summer issue of The Album will be out by the end of May, stop in the museum for a copy or grab a membership and have the issue delivered right to your door! This spring we explore “connections” of all sorts, starting with our three buildings. Each building has fascinating history; sharing those stories remains a focus. However, with the buildings’ unique character so goes the upkeep. Last March, a thaw of snow and ice caused 500 gallons of water to pour into The Buffalo History Museum’s Reinstein Center. The water intrusion wreaked havoc on our daily operations forcing Buffalo State’s Museum Studies program to halt their work cataloguing the Howard Beach Collection and 7 of our full-time staff members set up make-shift offices in public areas of the Pan-Am building which was closed for City funded electrical renovations. A twist of “luck” for the relocation, indeed! It didn’t take a waterfall to let us know a thorough and sound plan for repairs was in order. A generous grant by John R. Oishei Foundation funded a $120K facility and space utilization study of our three building campus to be delivered summer 2016. The resulting road map will explore the potential of our entire campus, services and relationships, while prioritizing capital projects and estimating costs. In January, the Museum board and staff participated in a transformational planning session assessing TBHM priorities and considering national trends for history museums. This precious time for sharing and thinking, facilitated by author, architect and historian Franklin Vagnone, opened the floor to discussions around relevancy, identity, physical fitness and commitment to the community. The results of these discussions and our facility “road map” will frame our strategic vision for 2016-2019. I encourage you to remain, or become, engaged in the further processes ahead so that through our actions we better serve and reflect your aspirations and expectations of The Buffalo History Museum. P.S. Please remember to check out our calendar of events and join us for a season of fascinating stories! During my tenure here at The Buffalo History Museum, I have had many interesting items and collections come across my desk. The vast majority are from generous donations and a select few are ones my boss has found. I’ve decided to pick out a few of my favorites to share with you. This poem is written on the back of a note from Augustus Strong of Rochester to Wilson Bissell of Buffalo; however, the author of the poem is unknown. What is so intriguing about the poem is the prediction of President McKinley facing St. Peter and answering for his polices while holding office. The poem was written in 1899 and sent to a resident of Buffalo. As you all know, President McKinley was assassinated two years later in Buffalo. Library catalogers typically don’t encounter 3D objects; those are more frequently found in museum artifact collections. However, we received a donation of a deck of Pinochle playing cards from H.A. Meldrum and wanted to include these in the library collection due to the image of the department store on the cards. This was a unique challenge to accurately describe the cards, a 3D object, within the confines of a library catalog that typically deals with paper. Just like the many archives of the world, we too make our own discoveries. While only ‘lost’ for a short time, the needs of this collection were finally able to be met 10 years after acquiring it. The collection was donated in 2003 by Dr. Bruce Lee, a descendant of Cook. Edward was the son of Henry Cook, who came to Maryland in slavery from Africa. Henry escaped slavery and joined the Mohawk Indian tribe. He met and married Patty, an Indian woman, and together had Edward, making Edward a free man. 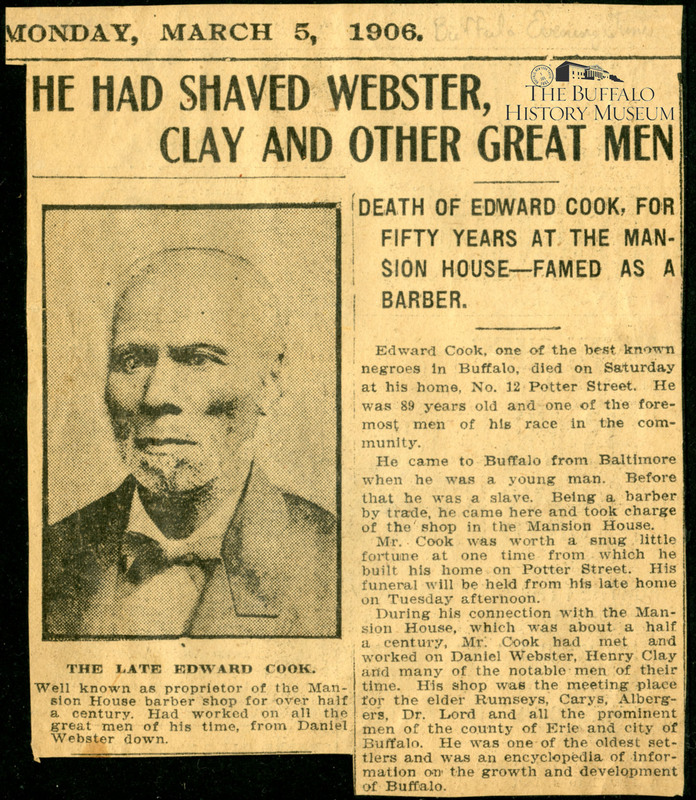 Edward moved to Buffalo as a young man, where he made a living being a barber at the Mansion House. The collection includes a photograph of Edward, Baltimore County freedom paper certifying he was born free, baptism certificate for Edward, a permission note to travel at night and his obituary. 5. Queerie queers with hands, wings and claws with illustrations by Palmer Cox. 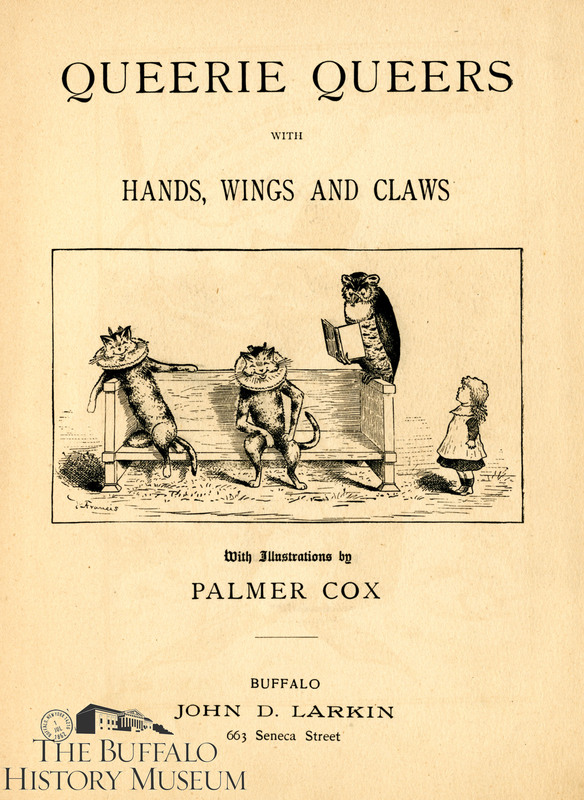 This children’s book, illustrated by Palmer Cox, was published by John D. Larkin out of 663 Seneca Street. The book features many short stories, magic tricks to do at home and less than common nursery rhymes. For example, I grew up on the simple version of “Jack and Jill went up the hill to fetch a pail of water.” However, the version John D. Larkin helped to publish had a much longer introduction to Jack & Jill. “For an idle lad, as he was, Jack had no traits, after all, that were very bad. He was simply Jack with the coat on his back patched up in all color from gray to black. Both feet were bare; and I do declare that he never washed his face; and his hair was the color of straw.” Thankfully, his soap business was more successful than his publishing. The shop at The Buffalo History Museum is not simply for souvenirs. Although we do have plenty of those, we also stock items of local interest that are difficult to find elsewhere. We carry a wide range of books about local history, many by local authors. Among our book selection is an excellent collection on Native American history. Thumbing through the pages in this collection reveals a breadth of fascinating knowledge. Most of us in Western New York have at least a rudimentary knowledge of local Seneca and Haudenosaunee (Iroquois) history. But, our book collection on this subject dives into deeper levels of understanding on this important local culture. One author who has spent his life digging into buried Iroquois history is Gerry Biron. It is important to note that Biron, like many Native authors today, prefers the term “Haudenosaunee” to refer to the Iroquois people. Haudenosaunee is the name the Iroquois use to refer to themselves, and more people today are realizing it is respectful to use the Native term rather than one thrust upon them by outsiders. Just as their name is being revived, Haudenosaunee art is also being given the recognition it deserves. Biron has spent years researching and collecting Native American beadwork made by the Haudenosaunee people from New York to Canada. He explains the historical importance of beadwork to the Native people. Each design is filled with symbolism and meaning. The beadwork would grace clothing and accessories. Eventually these accessories, especially small ladies’ bags, would be sold as souvenirs at Niagara Falls. Today many in the art world from collectors to galleries are emphasizing the notion that categories such as “folk art” and indigenous art have long been dismissed as kitsch, or “less than” the fine art standards as defined by Western sensibilities. Biron has made it his mission to redefine our perceptions and elevate Native beadwork to be recognized as art of important significance. His collection of beaded bags and antique photographs of beadwork have been displayed in galleries in the American Northeast. The Buffalo History Museum Shop carries two of his books; A Cherished Curiosity and Made of Thunder, Made of Glass. Another author who is digging through hidden Native history is Sally Roesch Wagner. In her book, Sisters in Spirit, Wagner explores how women’s rights advocates were inspired and influenced by Seneca women and cultural traditions. We know that The Women’s Rights Movement of the mid-19th century was concurrent with the Abolitionist movement. These two groups often worked together, as both recognized that they were two disadvantaged groups in society. These movements were heavily based in Western and Central New York. In fact, both the Susan B. Anthony House and the Frederick Douglas Resource Center are located in our close neighbor city, Rochester. The famous Seneca Falls Convention for Women’s Rights was held in Seneca Falls, NY, in 1848. But, many of us don’t realize the ties between women’s rights advocates and the local Native people of Western, NY. Sally Roesch Wagner says that while Susan B. Anthony is the main person that history often focuses on when discussing the Women’s Rights Movement, she chooses instead to discuss Elizabeth Cady Stanton and Matilda Joslyn Gage; two women with strong views that are controversial even today. But, what is striking about these women is their efforts to immerse themselves in understanding the culture of their Seneca neighbors. While many people today don’t understand the complex dynamic of the hierarchy of the Iroquois Federation, Wagner explains that Harriet Maxwell Converse, a close friend of Matilda Joslyn Gage, understood it very well. Converse explained that the Iroquois Federation was made up of six distinct nations, and each nation was unique. She says “The Seneca Nation… is as distinct among Indians as France, Germany, and England are distinct among the nations of Europe” (p23). Within each nation are several tribes. Therefore the Seneca are not a tribe, but the nation that houses many tribes. This distinction is important because referring to the nations as tribes diminishes their status and affects how they are perceived by those responsible for negotiating and honoring treaties. Because they exposed themselves to Native life and culture, these women’s rights advocates observed a social dynamic completely unlike the Western model. While men and women of the Seneca certainly did have gender roles, their roles did not subjugate women. Since the Seneca traced ancestry through the matrilineal line, women retained custodial rights of children, whereas European American women lost custody of their children in the event of a divorce. Other issues which are uncomfortable to discuss, such as a women’s right over her own body and domestic abuse, are also explored by Wagner. In an age when a woman who fled from an abusive marriage could be forcibly returned to her husband just as runaway slaves were returned to their masters, women’s rights advocates from Upstate New York found inspiration in the rights afforded to their neighboring Seneca women. 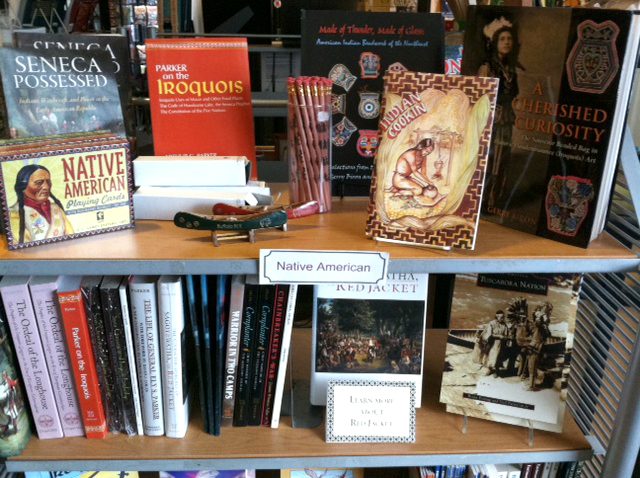 These books are only a fraction of the Native American selection we stock here in the Museum shop. While these examples highlight largely unknown history, we also carry books that are more general overviews, as well as children’s history books about Native culture, as well as gifts and trinkets such as playing cards, miniature canoes, and other items. These items compliment a visit to the museum to see our wonderful Native American exhibit. So, please plan a day to learn a little about local Seneca culture at the Buffalo History Museum and Shop!